The Black Sheep Dances: New Giveaway of The Last Brother...and previous winner! New Giveaway of The Last Brother...and previous winner! Now, another giveaway! 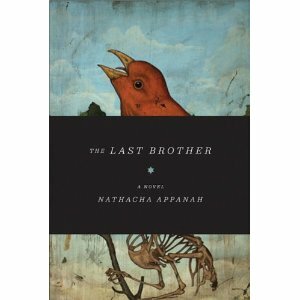 Graywolf Press generously sent me an extra copy of The Last Brother by Nathacha Appanah, a work of translation to be released February 1, 2011. This is not an ARC, it's a final copy, and the giveaway for it starts now and ends January 20, 2011. US only (the next giveaway will be international, I promise!). Rules are as follows: you must follow the blog and leave your name and contact info in the comments of this post. You don't have to leave an email if you use GFC. My review for the title will post Feb 1. I'm sure it'll be great, because the 'wolves' at Graywolf take pride in their books. Devin was selected by random generator to win the ARC of The Devotion of Suspect X...I am emailing him right now. He has 24 hours to return to me with an address or I pick another. Thanks for supporting the contest and please check this title out, even if you didn't win. It's just not 'any' mystery-the plot and procedurals are intriguing. I heard about Nathacha Appanah through Stu's blog (winstonsdad.wordpress.com). Would love to read the novel! Thanks for hosting this giveaway! I'm following through GFC! I'd love to read this one. I always literature in translation. I am a new follower of your blog through GFC. I follow your blog. Can't wait to read your post about this book. Cheers for holding this giveaway! I am a gfc follower, and I would love to read the book.